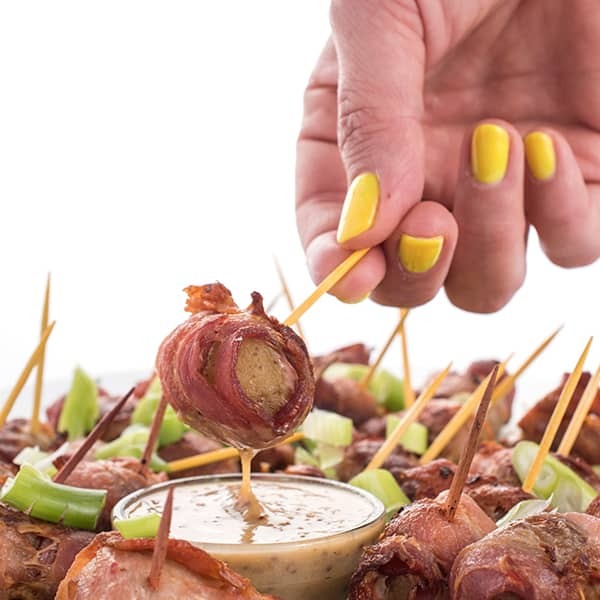 These easy two-ingredient bacon wrapped potato bites make the perfect party appetizer! 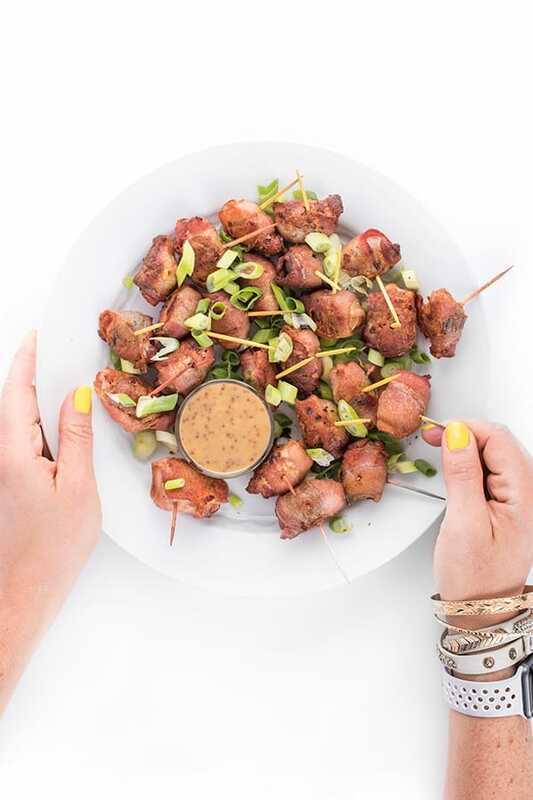 Serve with a simple honey mustard dipping sauce to elevate the dish even further. 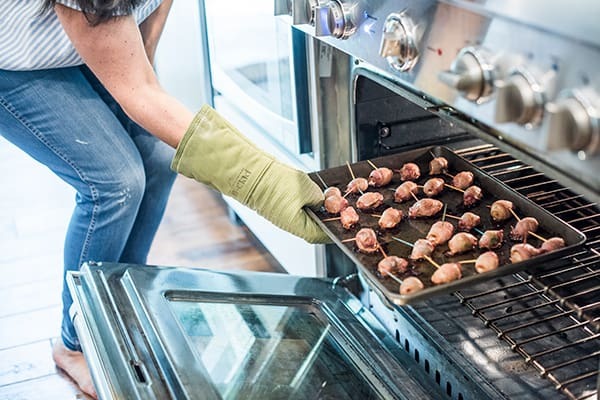 As the fall entertaining season starts to ramp up, I wanted to share one of my latest go-to appetizer recipes: bacon wrapped Little Potatoes! 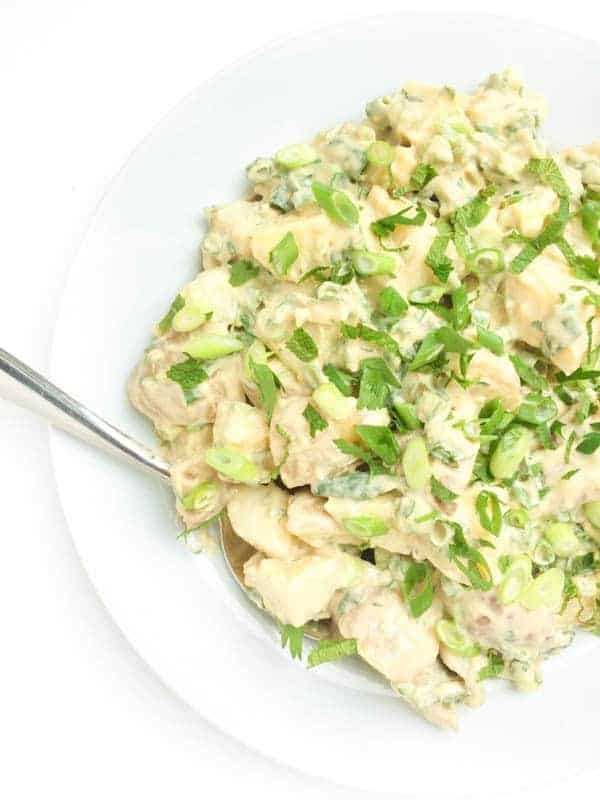 This easy, two-ingredient recipe couldn’t be easier to make or more delicious to eat! To start, I use my pre-washed, bite-sized Creamer Potatoes from The Little Potato Company. 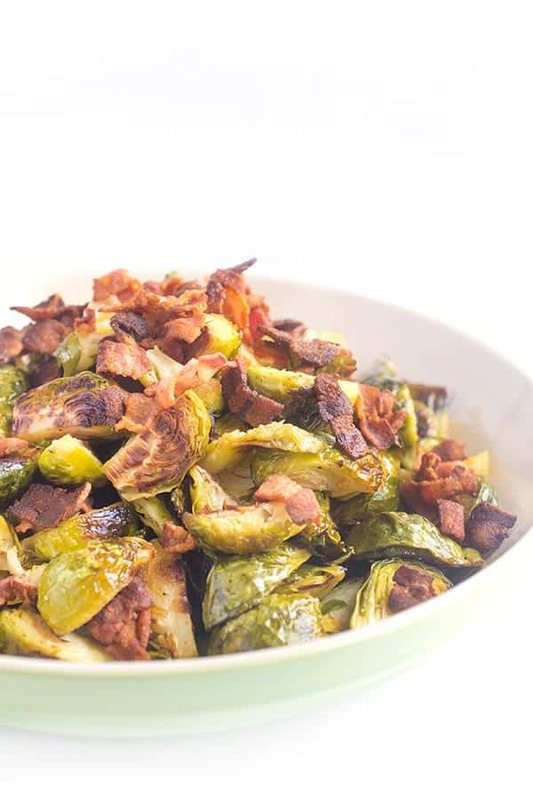 Any variety will do, really, as they’re the perfect size for this dish and naturally thin-skin which means no peeling required! 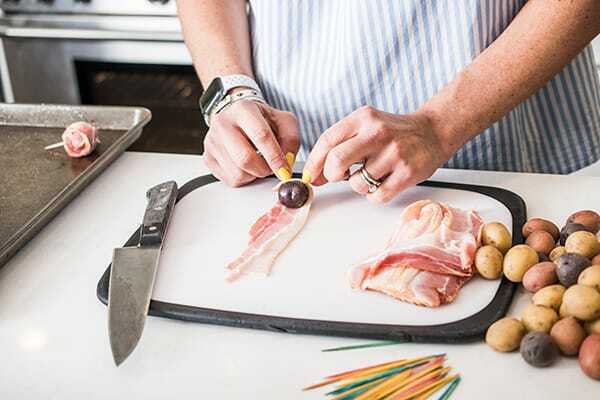 One by one I wrap each Little Potato with half a slice of bacon before securing each with a toothpick. To bake, pop in a 400 degree oven for about 30 minutes, turning once halfway through to ensure even crisping. While the Creamer potatoes bake, I whip up another two ingredient recipe: honey mustard dipping sauce. 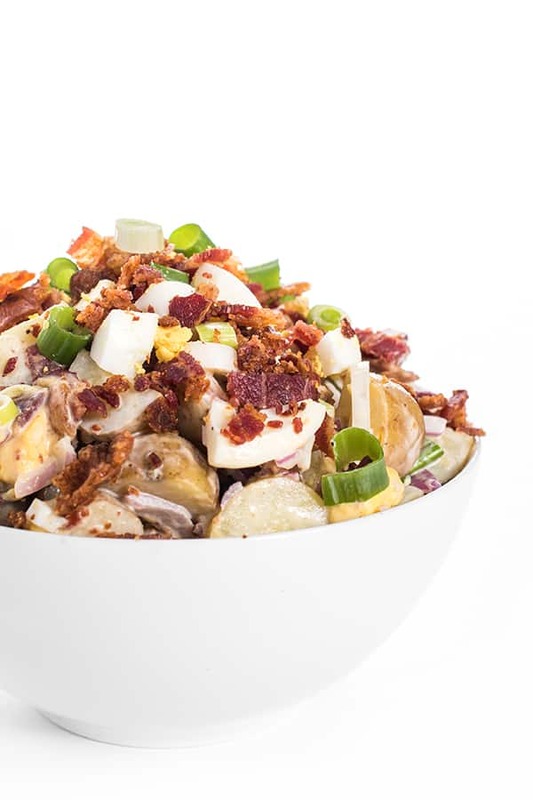 The sweet honey and tangy mustard are the perfect compliment for the creamy potatoes and smoky bacon. 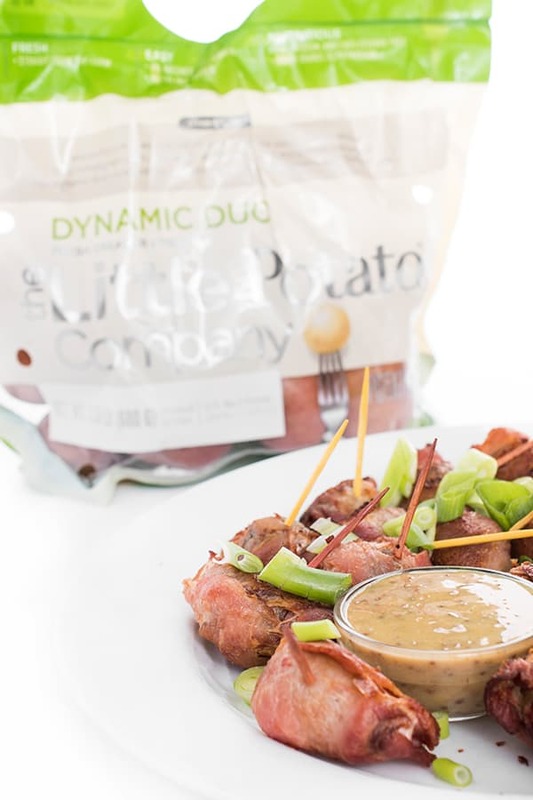 Keep a bag of The Little Potato Company’s Creamer Potatoes stashed all season long – they are available in different varieties and they’re always nutritious and tasty. 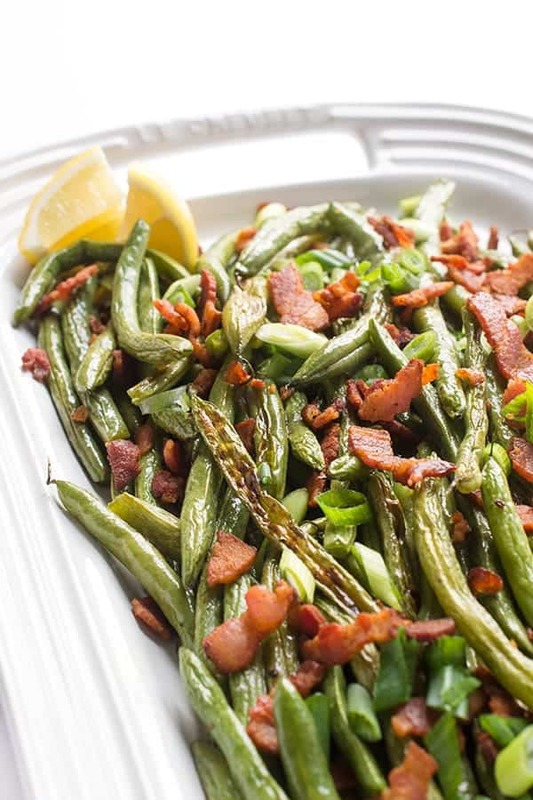 Since they’re so easy to use you’ll never be very far from a quick and easy recipe for entertaining! 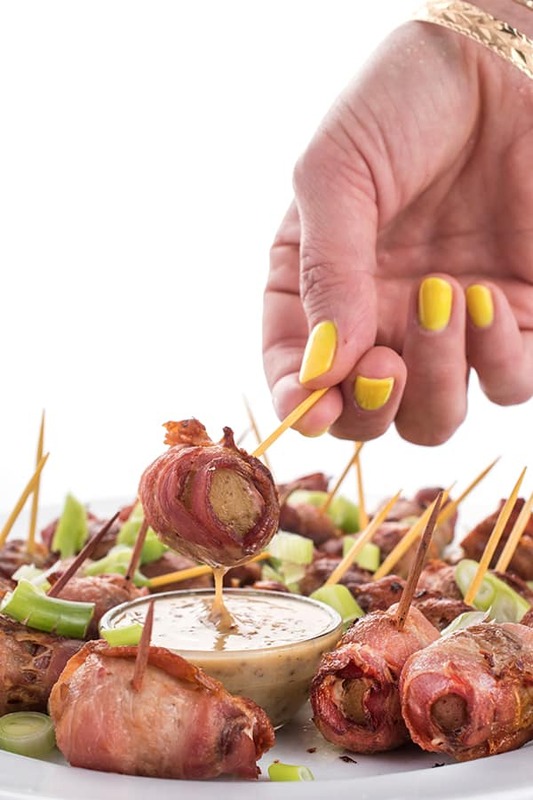 These easy two-ingredient bacon wrapped potato bites make the perfect party appetizer! Served with a simple honey mustard dipping sauce. 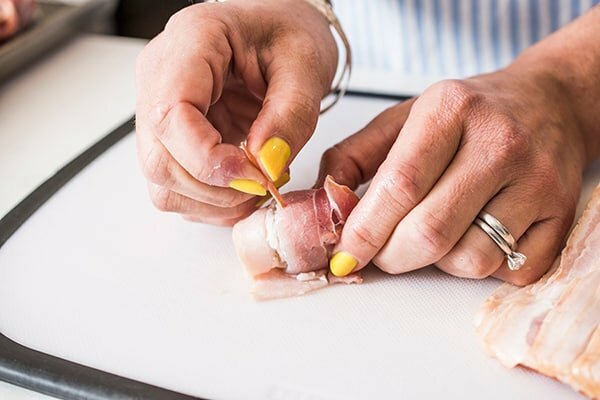 Wrap each Little Potato in a piece of bacon then secure with a toothpick. 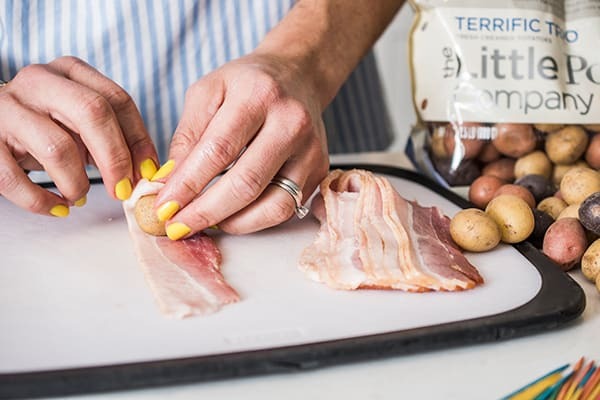 Place on baking sheet in a single layer, repeating until all potatoes are wrapped in bacon. Bake for 30 minutes, turning the potatoes over once halfway through to ensure even crisping of bacon. While the potatoes are baking, whisk together the honey and mustard to create a simple honey mustard dipping sauce. 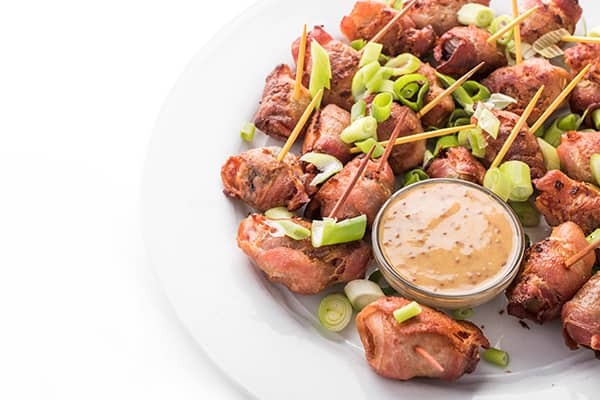 Serve bacon wrapped Little Potatoes with dipping sauce. 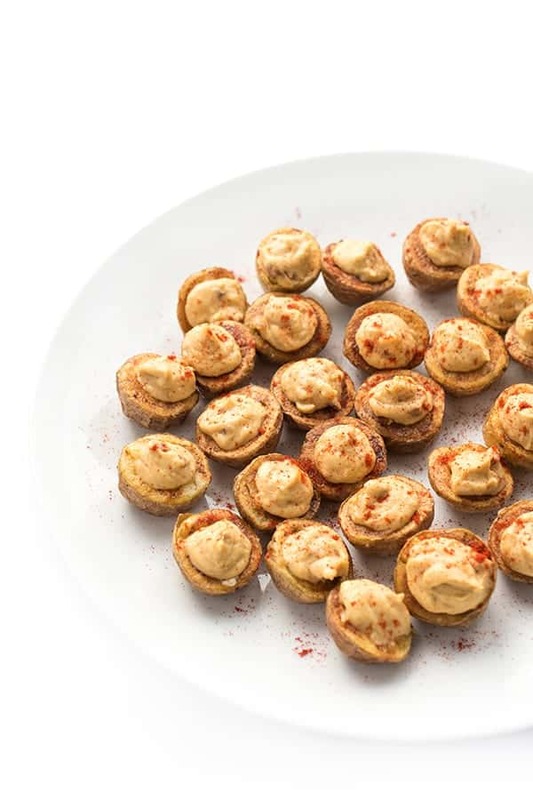 Want more delicious and easy appetizer ideas?? I’ve got you covered! Head over to my Pinterest board! Hi! Can these be wrapped and refrigerated a couple days ahead of time, and then popped in the oven before serving? These look delicious! I love that you added Dijon Mustard to the dish! Cannot wait to make this at home. 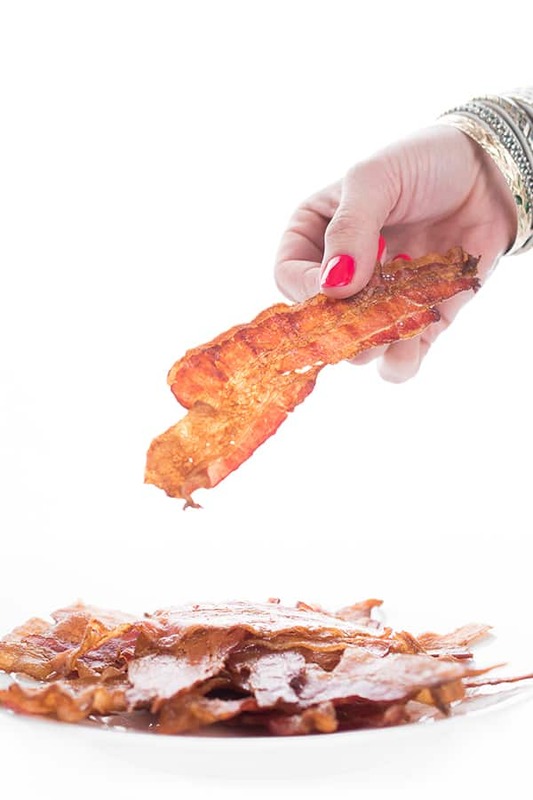 Love everything wrapped in bacon …. Thank you Liz !